Discussion in 'AV Receivers & Amplifiers' started by cableman, Feb 28, 2013. Anyway, it was time for a change. David Schultz, he of The Upgrade Company (TUC), came up in a discussion on avforums. One of Mr Shultzs cheerleaders chimed in with something positive only to be quickly contradicted by another poster who had had an awful experience with TUC. This new poster mentioned 'Cinemike' of MS Technik - a modding company based in Germany. Does modding work? I'm INCREDIBLY suspicious. You send your gear over to some unknown guy in another country, pay them a fair wack, and trust that they carry out the mod to the level they claim will upgrade your gear, and that it will be improved to the level far beyond its original abilities.Tough! I was intrigued. The poster on here had had an amp, bd player and was getting a processor modded by cinemike. He assured me he could see and hear the difference. Hear the difference I said? But it's over HDMI??? Are you serious? He was! We chatted for ages. He has excellent English. Theyve also been working on improving the Sony 1000ES projector( which I own) an Oppo, and a high end Bryston processor. ( apparently with Brystons full knowledge and blessing). His recommendation? Track down a Denon AVP and he'll improve it with their around 500 modifications on a standard AVP- starting with the fuse holder! Seriously! As luck would have it one was available from a poster on here. I bought it. No sound. It went back! Then I tracked one down to Unilet, paid for it and got it delivered. This one worked fine thank goodness. It's INCREDIBLY complicated to set up, soooooo many options. Eventually I got it set up as best I could. The guys at Unilet were very helpful in this endeavour. How did it sound? What about the picture? Bloody average. Not particularly impressed. Sound OR picture. I called Michael at MS Technik. What's the deal Michael? Apparently ONLY after their mod will it look and sound special. And that's where we are at right now. I'm sending my AVP and my new Denon 3313 Bd, which he also recommended, over to Cinemike soon for modding. It's not cheap. Will it work? Ill keep you posted. As you can see for me also some changes. I have sold the AV 7005 and the Sherwood to one of my best friends and he couldn't be happier. And in return i bought a stock AVP-A1HDA with the 3D update. Right after picking up i took it to CineMike for the complete tuning. Another dutch forum member also bought an AVP and going the CineMike route. We compared my CineMike AV 7005 HDMI to an older Classé SSP 75 (dts core with coax) and even when the AV 7005 was the clear winner. I was amazed about the Classé SSP 75. Sounded really nice. Very nice build if you compare it to the newer Classé processors. If you compare the SSP 800 there is hardly a part inside compared to the SSP-75. 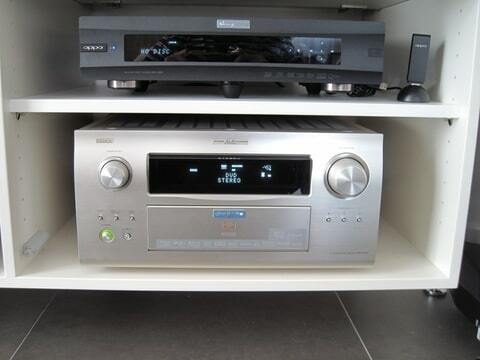 The upgraded AVP will be a good choice , together with a good source and amp. I liked it once upgraded. Compared to the upgraded AVP.. a matter of taste but we all liked the AVP better. There was something in the higher frequencies that i did not like, the avp was also a little more detailed. The upgraded AVP will be a good choice, together with a good source and amp. Youre claiming that a denon outperforms the amazing Bryston SP3. Are you serious? Maybe I should have named my post DENON BETTER THAN BRYSTON. that would have got tongues wagging! The upgraded AVP is far better than the Bryston SP3. It took some time to get the SP3 on the same level as the upgraded AVP, when i did hear it the last time it still was not a final version of the Bryston tuning. The HDMI part took some time to improve too. Mike is looking for an alternative for the AVP to offer to his customers, as the AVP is not available anymore. He has a couple of customers that are interested in the Bryston upgrades. But again important to keep in mind that all this is about upgrading, and not a thing between bad and good machines. In the standard world there is nothing better at the moment than the Bryston SP3. A dutch member mentioned Meridian but i have my doubts. My next mission will be a new amplifier. I have sold my Anthem A5 and Classé CAV-180. After having the Sherwood Newcastle coming from Mike, and i did experience it before when connected to my AV 7005, the Anthem Statement A5 was the bottle neck. It was dynamic but this is where everything ends. It did not have the airy high frequencies, midrange and the seperation that the Sherwood has. Bass was very tight and clean and was different with the Anthem. I did not like the bass at all. It had the nice midrange of the Sherwood, soundstage was good , but it lacked the seperation compared to the Sherwood, and also here (even worse than the Anthem) i hated the bass. It was everything but controlled. And according to some Classé experts/lovers in Holland the older Classé amps are still the best, the CAV-500 (reference) and the CAV-180. I took the Anthem and Classé both to Mike and there it was the same. Mike took a standard Marantz MM 8077 amplifier (not upgraded) and i was really surprised about the sound. Very nice for a standard amp. It does not have the power of the Anthem but this is a really nice amp. Mike has an upgrade for the MM 8077 and guess what? This will be my new amplifier. Mike will bridge two channels so i will have more power for the main speakers. I will have 5 channels instead of 7 but i will be happy. I am limited in space so i will only have space for one multi channel amp. Upgrading the Classé was not an option. I cannot give the Classe the airflow it needs in my cabinet. Also i don't want class A. Waiting for an upgrade for the Anthem was not an option. They don't have much time to develop. I have sold the Classé and Anthem and next week the Marantz will be ready. If i would have space my choice would be an upgraded Emotiva Xpa-2 and 3. The XPA-2 is a true beauty once upgraded, and was not far behind the reference Advance Acoustic MAA 1000. Keep in mind that to get the full benefith of the Cinemike AVP , you will need the source and amps tuned by Mike. Bold claims my friend bold claims! Jump on the plane and experience it your self. In the last two years i have had so many auditions with all the big brands compared. Because it's Bryston and has a high price tag doesn´t mean that there isn´t room for improvement by other people. The best gear is coming from Germany, look at brands like Audionet or Burmester. Mike is not using more expensive parts, but better parts compared to the parts most manufactures use in their gear. The quality is poor most of the time. And off course the man in charge Michael the tuning expert. This guy is unique with his work. Enough said who am i? They offer zero evidence, period. Testimonials are just that. I got a unit modded upgraded and could not tell any difference but each to their own. Fair comment. I dont have an oppo to upgrade. Anyone who has one modded by cinemike care to wade in? What " evidence" were you expecting from them Kobbe? You will find that these mod upgrade companies most of the time will not disclose the modifications they perform to the hardware, if any. You will find that these mod upgrade companies most of the time will not disclose the modifications they perform to the hardware. Not true in the case of MS Techik. I've discussed the mods to my AVP They claim 500 part changes - we've only discussed about 50 so far! Well the proof will be in the pudding, keep me posted. Why should i try to convince other people if they like what they are having. It doesn't lead to anything, and i don't like getting into some sort of anti-Cinemike battle. If people don't believe what i am writing, that is fine with me. I would probably do the same, i don't blame them. Tell me your experience, why did you buy there? What set up are you using, how did you get to know Cinemike? Sorry but we are not talking about The Upgrade Company here. They don't make a secret of what they are doing. Hi Kobbe. Sorry to be a pest but it would be really helpful if you could supply this info. For some reason Kobbe has PMd me rather than post on here. I'm curious as to why but hey ho. I've told him, no probs, if I think it does. I surely will! Does anyone else think his comments are a bit off? or are you in the 'all cables sound the same, all HDMI sounds the same' camp? are you a Luddite Kobbe? Cableman, you are clearly trying the stir up approach by posting my pm reply sent to you, whatever your trying to achieve I don't know. I expressed my own opinion from experience but you take it to another level, each to their own. What is your agenda here Kobbe? if you cant prove it then others on the forum can draw their own conclusions as to who you are and what your agenda is. Cableman you talk a lot of b..., and you clearly have a screw loose some where. Don't contact me again..
You sent me a pm asking me to respond..
Again, you didn't really get the guys in germany to mod your oppo83 did you Kobbe? Time for the mods to chip in eh? Here you go talking more dribble again, I see that you are regular on the classifieds always trying to haggle to get something for nothing and your other tatic of returning goods purchased claiming faulty - your just a hazard, end your dribble talk.. thanks.